Atwater , once the largest village in Kandiyohi County , was begun as a railroad contractor's store in the summer of 1869 by Christopher L. Peterson. Prior to this time a post office had been maintained on Summit Lake , two miles west of the present village site. From 1869, until the village was incorporated in 1876, it was known variously as Summit Lake , Stockholm and Gennessee. When the town site was formally established, it was named for Dr. E. D. Atwater, of the land department of the St. Paul and Pacific Railroad which had the original land grant. In 1871 Mark Piper, who was prominent in early county politics, opened a general store; and the hardware firm of McKinney and DeTar was organized. Getchell, Salter and Pines took over the store opened by Christopher Peterson, and added rooms for a hotel. Mr. Salter also opened Atwater 's first lumber yard the same year. Other new businesses in 1871 included G. B. Dahl's blacksmith shop, Louis LaFoe's hotel, and Pullen's general store which was moved to Atwater from Harrison. Dr. J. S. Gibson, Atwater 's first physician, arrived in 1873 and remained for many years. Two of the Gibson children are buried in an unkept cemetery on the shore of a small lake north of the village. The next years marked a period of growth. As more settlers, mostly from Sweden, Norway and Germany, arrived to buy or "take up" land, the village grew to serve their needs. For a number of years Atwater had four elevators which served farmers within a radius of thirty-five miles. Mark Piper, a curbstone grain buyer, also helped make Atwater a grain-buying center, by paying consistently high prices. James Strong opened a livery stable in 1878, which later became Strong Motor Co., the second oldest Ford dealership in Minnesota . A Mr. Sager opened a mineral water spa beside a small lake within the village limits, which drew people from a number of states who came to bathe in the mineral water. In 1891 a fire swept the business district, and destroyed seven buildings with most of their contents. By an ironical quirk most of the residents of Atwater had reduced their insurance coverages because of a recently organized volunteer fire department, and most of the firemen were out of town when the fire broke out. In its heyday Atwater also boasted a hotel, clothing store, dry goods store, Chevy dealership, jeweler, lawyer, doctor and theater (where a contortionist and famous Swedish comic known as Olla i Skratholt once performed). Atwater 's four churches were organized between 1868 and 1891. 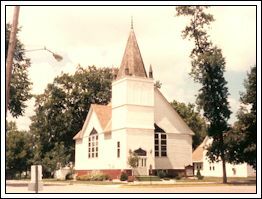 Immanuel and Trondhjem (now Bethlehem ) Lutheran Churches were all established in 1868. 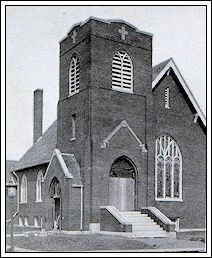 The First Methodist Church was organized in 1873, and a Presbyterian Church was organized in 1891. The latter was sold to the Lake Elizabeth Baptist Church , when the congregation decided to move to Atwater; it has subsequently disbanded. A Catholic Church is located in the neighboring town of Kandiyohi . 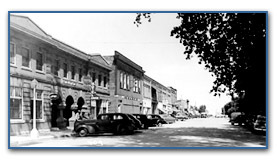 Atwater 's first band was organized in the railroad depot in 1875, and merged into the Atwater High School Band which was organized in 1936. Atwater 's Roller Mill was built in 1898, and destroyed by fire in 1944. A village hall was built in 1887 and was the center of community affairs for over half a century when it was wrecked and the village purchased a business building for a hall, meeting place, city offices and library. 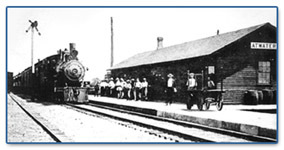 It was replaced by the former Atwater Train Depot, moved a block north from its railroad site, followed by a new location in 2011 (see below). Records of Atwater 's schools were sadly lost in the fire of 1891, so it is unknown when the first school was organized, but Miss Monrovia L. Hutchinson was the first teacher. A school was built in 1898, with major additions and improvements in 1936 and 1955 and 1980. The school district was consolidated in 1953, and again in 1996 when the Atwater-Cosmos-Grove City district was formed with the high school moving to a new facility just south of Grove City . An elementary school remains in Atwater. Atwater was the home town (or near home town) of several famous people. Mary Gibbs (Park Commissioner who “saved ” the shoreline headwaters of the Mississippi River in 1903 – see the plaque near the Headwaters dedicated to her) was born just outside of town. Governor Harold Lovander (1967-71) was the son of a former pastor of Immanuel Lutheran Church. Internationally renowned artist James Rosenquist spent much of his childhood in Atwater – grandson of farmer Louis Rosenquist of Lake Elizabeth Township. Major Leaguer Mike Kingery (Kansas City Royals, Colorado Rockies) still lives in the area. The first proposed site for the State Capital, the Acton Massacre precipitating the Great Sioux Uprising (1863), and the site of the origin of the Farm Holiday Movement (former John Bosch Farm, 1933) all are nearby, as is one of the last stands of original old growth forest. There is even a story of a clash between American fur traders and those from the Hudson Bay Company near Lake Elizabeth in the years prior to statehood. While local farms have consolidated over the years, farming is still a very important part of the community. The Atwater Cooperative Creamery Association served farmers of the area since 1891at one time handling 30,000,000 pounds of milk a year and producing 1,400,000 pounds of butter. A Soil Center was subsequently added, the Creamery portion dropped. The Association merged with Central Lakes Coop of Willmar in 1996, but returned with a new, larger facility east of town in about 2005. Several independent local businesses also focus on the farm community: Whitcomb Construction Crane and Whitcomb Grain, Unlimited Ag, Mickle Grain Dryer, Repair & Service, Atwater Equipment Co., and Atwater Elevator Inc., among others. The post-World War II years, in particular the decade of the 1970s, witnessed substantial changes as a result of the farm crisis of that time. Lost were Holm Bros. (IH) Implement and Hardware Store, Nelson Bros. Big Store (variety), Mahn Hardware Atwater Drug store, and the Atwater Herald weekly. A few restaurants/bars came and went as well. It seemed as if the prediction of U of M sociologist George Donahue was coming true: county seat towns in rural Minnesota would grow at the expense of satellite towns in the county. (Mark Drabenstott of the Federal Reserve Bank of Kansas City has considerably refined the analysis). However, this was not the last word. The Municipal water system dating back to 1902 and an upgraded sewer system (2011-12) remain. The town enjoys cable TV, a high speed wireless internet connection, a fiber optic line commercially available, two community parks, a fishing pond and the 18-hole Island Pine Gold Course (1993) on the edge of town in Gennessee Township. Furthermore, recent years have seen something of a revival in town. Beginning in the decade of the 1980s Jenny-O Turkeys built a large feed mill on the east end of town. American Industrial Refrigeration expanded its operation as well, and in the first decade of the new millennium Bushmills Ethanol began operations (expanded in 2009), providing 30+ new jobs and a price advantage to local farmers. This was soon followed by the aforementioned Central Lakes Coop with a staff of 34. Retail business has participated in the fun with the establishment of Schmidty’s Convenience Store, Thompson Bakery/Café on Hwy 12, IDK Bowling/Bar, and a very new facility for Farm Bureau Insurance and Thrivent Financial. A devastating fire on Feb. 28, 2011 took out 4 businesses in the downtown area but that did not stop Sticker Boy (graphic arts design) from relocating nearby, and the Peaceful Thymes Nursery from relocating and adding a hardware store. Continuing to proper are Vern’s Town & Country Foods under the direction of the next generation (Keith Passmore) and the Atwater State Bank, established at the height of the Great Depression in 1932 after 2 other local banks failed. ASB added a branch in the neighboring town of Kandiyohi in 2007, while its holding company, Cattail Bancshares, Inc. based in Atwater acquired the State Bank of Kimball in 1985. Even local amenities have been enhanced in recent years. The old Atwater Hotel, a national historic register building, was saved, donated to the City and renovated with the help of State funds to serve as the site of new City offices, police department and library in 2011. Nearby the former Strong Garage, the oldest existing Ford Garage in the State, was reconfigured as an art space and popular event venue. A little league sized ball field was created (named in honor of long-time sports volunteer Gordy Johnson) and improvements to the baseball field, Kingery Field, home of town team Atwater Chuckers, were made with the addition of dugouts and a wonderful concession stand. 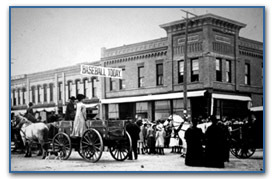 Over the course of 150 years the town has witnessed new settlement, commercial and residential development following the advent of the railroad, participation in several wars, crises on the farm, national depression and recession, and technical transformation (mechanized agriculture, consumer automobiles, fiber options, internet connectivity). It is a story that requires perspective to appreciate.